When was the last time you clicked on a banner ad? Chances are it’s been a while and you’ve since forgotten what the ad was about. Over the years, internet users have become oblivious to banner advertising. As Andrew Chen writes, growth is getting hard from intense competition. Here's a graph that exemplifies the sharp decline in performance of retargeting ads. In addition to not clicking on ads, people are also preventing them from being displayed at all. 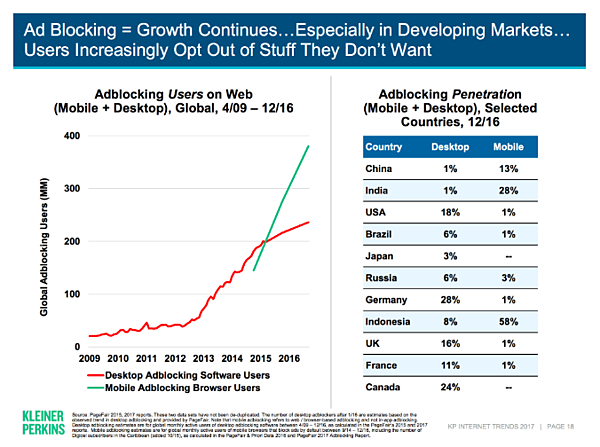 The Mary Meeker report reveals that the number of users using ad blocking software has skyrocketed in the last 4 years. When it comes to e-commerce business, the challenges marketers face are no longer limited to cart abandonment or poor conversion rates. Building user loyalty is the holy grail in e-commerce. Thanks for stifling competition, consolidation and saturation, marketers are continuously hunting for that one silver bullet. Paid marketing on platforms like Facebook and Google doesn't suffice as a competitive edge anymore. Competitive intelligence is easily available and paid user acquisition strategies can be replicated in days. The result - as more and more businesses target the same users, customer acquisition costs skyrockets. So does Facebook’s average revenue per user. Standing out from the crowd has become more of a challenge. About 10% of the websites online today are e-commerce businesses giving users access to a wide variety of products. It is difficult to stand out from, let alone beat such intense competition. No wonder it’s become so difficult to acquire new customers with the volume and intensity of online competition being so high. Reports point to the fact that it is 6 to 7 times easier to drive repeat transactions than to generate sales from a new customer. In other words, getting an existing customer to choose your product requires much less effort than it would to convince a new person to spend their money toward your brand. When it launched 25 years ago, Amazon was merely an online bookstore. The company has now grown into the world’s largest online retailer. The e-commerce giant achieved this phenomenal growth by understanding customers and aligning their marketing efforts with their shopping behaviour. Amazon’s secret ingredient is their loyal customer base, built over many years. There’s no denying that repeat users bring more value to a business than new customers which is why Customer Lifetime Value or CLV should always be taken into consideration. CLV is the total net profit that a customer generates during his or her entire journey with the business. The ratio of CLV to CAC more clearly reflects the profits brought on by each customer. According to Klipfolio, the ideal CLV to CAC ratio should be 3:1, so a customer should generate three times what it cost a company to acquire them. Considering this ratio, it is evident that customer retention is critical to a business’ health and growth. It is also well known that selling to existing customers is comparatively easier and increasing the retention rate by 5% could help a business boost profits by as much as 25% to 95%. Check out these 7 surefire ways of customer retention. Businesses are increasingly experimenting with newer marketing channels to engage and retain their users more effectively. Over 15,000 businesses push over 2B notifications every month to generate over 20M visits to their website. Learn more about using web push notifications for driving user retention. Let’s take a quick step back to understand what web push notifications are. Web Push Notifications are clickable messages that a user receives on a desktop and/or mobile from a website. Technically, marketers can start sending notifications to users as soon as they subscribe to a store. Since these notifications are delivered even when users are not on your website, they enable retailers to build a definite recall. Visitors often shy away from sharing personal information such as email addresses or phone numbers. This is not an issue in the case of browser notifications since such information is neither required nor stored. Web push notifications tend to prolong the average time users spend on a website as well as boost their cart value. Effective retargeting can help e-commerce websites to reduce their CAC, as this enables them to retain their customers. However, tracking these online customers is quite difficult as they aren’t clearly identified. Web push notifications make retargeting these customers easier since notifications are device independent. Your customers won’t even be required to visit your website to receive notifications from you. Web push notifications generate higher click-through rates s when they are directed at the right users. Therefore, it’s important to segment subscribers before pushing out notifications. Here are some notification templates for e-commerce marketers that help evoke emotions. In addition to driving sales, sending out relevant push notifications also makes your brand more memorable to customers. The key here is relevance, not frequency. Communicating about special offers or wide product range over a period of time will help retailers build top of mind recall among their customers. This will further aid in enhancing the lifetime value of each customer. Boost average order value by encouraging customers to purchase more. Communicate the additional value that they will get by ordering a higher priced product efficiently with web push notifications. For instance, a customer who has previously shown interest in purchasing an LCD TV can more easily be geared toward a more expensive LED TV by conveying benefits such as better picture quality, low electricity consumption, etc. Providing your customers with product suggestions that account for their buying preferences lets them know that you’ve taken their taste into consideration. Rather than bombarding them with products they have no interest in, send something that they would like. Once you have access to data about what users want, marketers should seize the opportunity to cross-sell relevant products. For example, a customer who has just purchased a phone is likely to show interest in related accessories like headphones. Referring to customers’ purchase history and wishlist allow the segmentation of users based on their previous needs and interests and enable a more personalized shopping experience. Users are less likely to disregard a push notification if the content directed at them is based on their user persona. Web push notification is a great way to drive loyalty programs and enable customers to accumulate points. You can foster a more positive shopping experience for customers by rewarding them for spending their money in your online store. Marketers should also build close loop campaigns to receive feedback from customers on their shopping experience and, in return delight them with incentives. Building loyalty amongst customers goes a long way as it could lead to increased lifetime value. 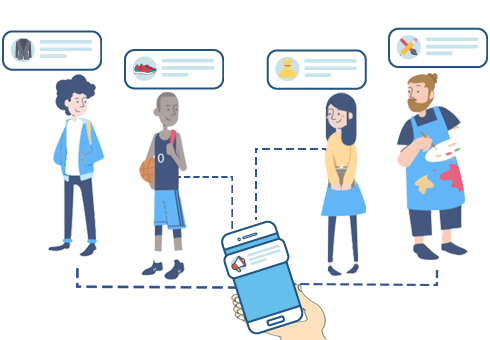 With web push notifications, e-commerce stores can easily reach out to new users and reconnect with disengaged customers. They also serve as a vehicle for information about new stock updates or the return of popular items. By using web push notifications, retailers can reward loyal customers, collect feedback and address cart abandonment. To draw some inspiration, check out some e-commerce web push notification templates. Web push notification is a potent channel, which is already turning to be a strong ally for e-commerce businesses. This article was originally published on Lightspeedhq. Aditya Krishna is a Product Associate at iZooto who doesn't understand the phrase 'too much coffee'. Quite fond of meeting new people, he deeply cares about social issues and is passionate about finding ways to make a positive difference in people's lives. Apart from this, he loves doodling in his free time and is an amazing bathroom singer.